The dining area is brightly-lit, with the baby blues harmonizing with the baby blues and light yellows. Nice theme for dining. Plus, they have these rustic chairs for a homey feel, although I was quite afraid that the chair might give way if I lean on the backrest. What a scene that might create! There are also a couple of "swings" at the center of the dining area! Too bad these were occupied at the time of our visit. 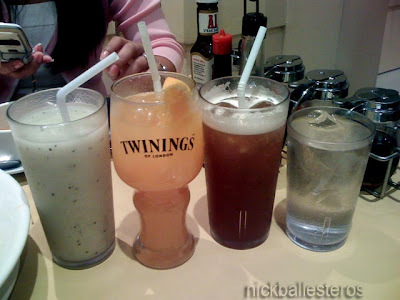 We ordered kiwi shake, orange jiuce, iced tea, water. 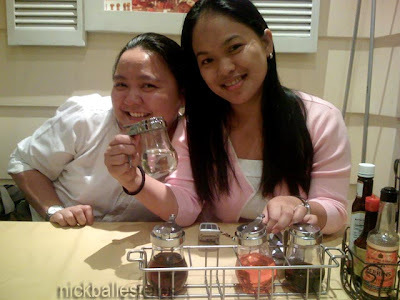 I had the bottomless iced tea. It was great, not those sweet varieties. I can see our companion enjoying her kiwi shake too! This is called Jackson 5 (I think). 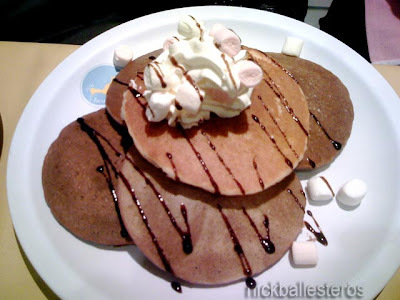 And these are the pancake syrups. Four flavors to choose from! I like the orange-colored one the best. This is the "molo soup" (pronounce it in a tenor voice!). The service is huge! 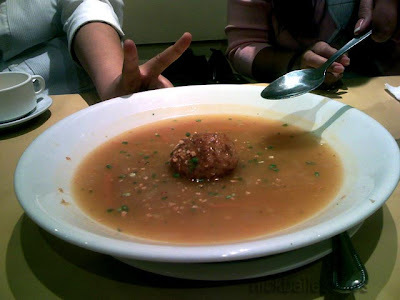 We got a soup serving for the three of us plus another serving, and the lone meatball was also quite big. 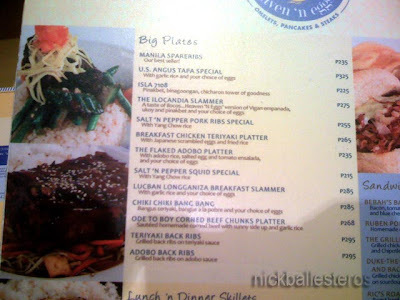 I ordered the adobo back ribs because they did not have the flaked adobo platter at that time. It's a very satisfying meal. However, you can only ever so slightly taste the adoboness of the ribs. 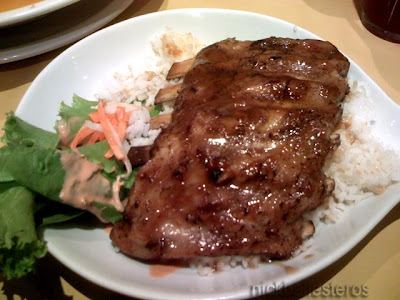 The name of the sauce usually used for ribs is hickory, right? Or hickory barbecue? 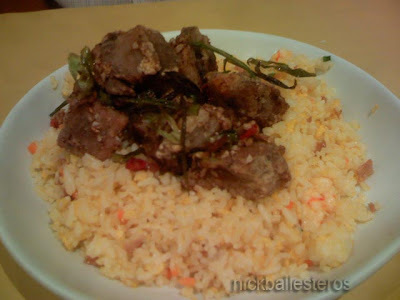 Well, it tasted more like that than adobo. Still, I was happy with my meal. And then, a couple of nights later, I had another chance to dine in this restaurant, a treat by Francis! Yay! 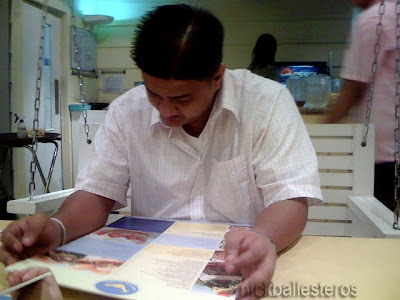 Here he is choosing from the menu. This time we were able to get the swinging chairs. We swung lazily while waiting for our order. 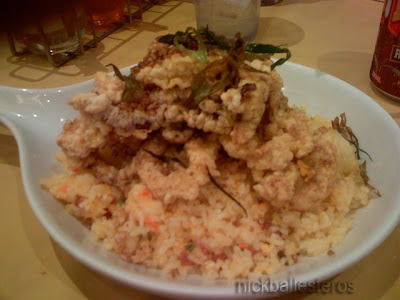 This time, I had the crispy adobo flakes. I don't know why this did not register, but I did not like the version of Baguio's Cafe by the Ruins. And this one tasted just like the one in Ruins. Am I missing something on how this was supposed to be eaten? 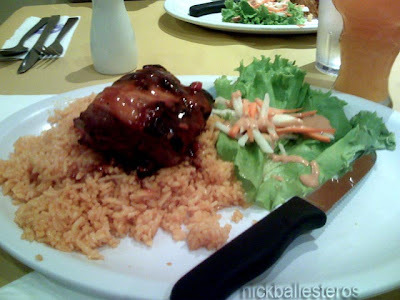 I do not like my adobo crunchy and dry :-(. I liked the red eggs with tomatoes, though. And it came with a couple of sunny side-ups. I also do not like sunny side-ups, but I made an exception for this dinner and I actually liked the gooey yolk on my rice :-). My companions fared better with the pork ribs and the salt and pepper squid special. 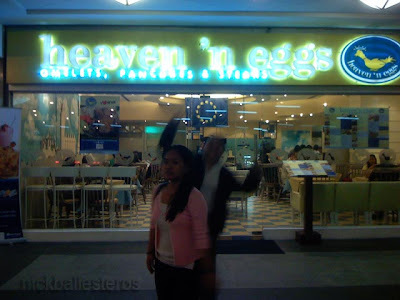 I like Heaven n Eggs for its ambience, yummy food, and generous servings. Courteous staff too. 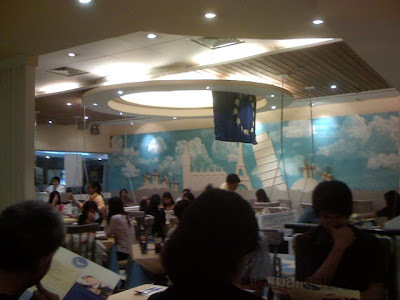 Will definitely visit again and order molo soup and try the other menu offerings. Kumain na rin kami ni kd dyan noong minsang mapasyal kami ng Glorietta. 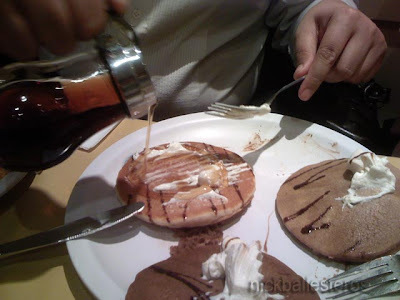 Tinikman nya lahat yung syrup ng pancake. 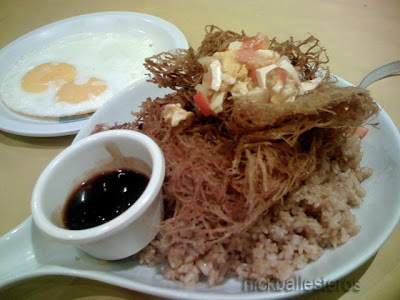 Nakatikim din kami ng adobo flakes ng Cafe by the Ruins sa Baguio, hindi nakain..hehehe. Ann: I like their pancakes and syrups too. I seldom find Kiwi Shakes here. Their business name is unique and sound intriguing huh! Chef Queer: Yeah... I thought they were a breakfast bunch but their menu is good to last the entire day. And you can also order pancakes at any time!